Top seeds in two categories crashed out in the second round of the VICTOR Korea Open 2018 today. 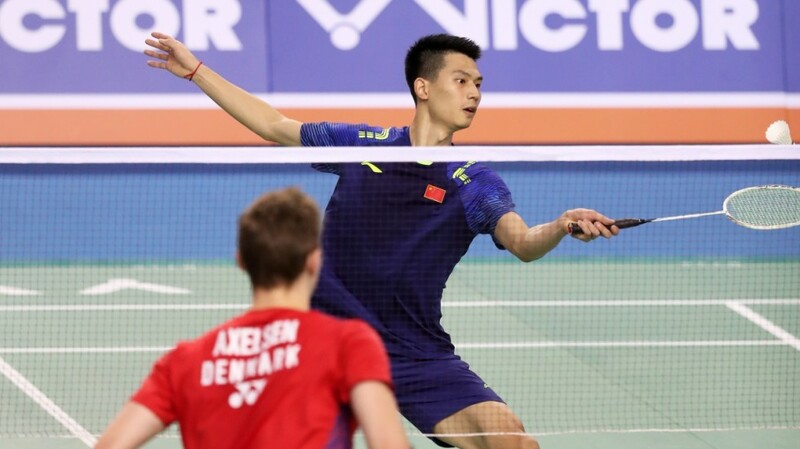 It was first the turn of Men’s Singles top seed Viktor Axelsen, who looked rather listless as he went down to China’s Zhao Junpeng (featured image) in straight games. Then Men’s Doubles top seeds Takeshi Kamura and Keigo Sonoda – silver medallists at the World Championships – fell to a pair who has been the talk of the event. 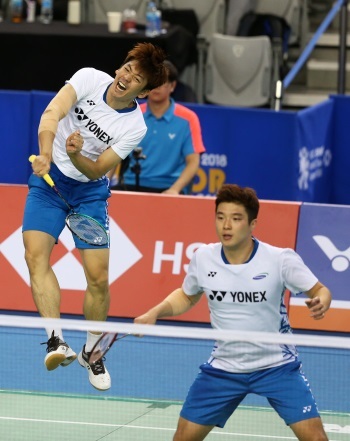 Home duo Lee Yong Dae and Kim Gi Jung, who are playing only their second international event of the year, were on fire again today as they took down Kamura and Sonoda in comprehensive fashion, 18-21 21-10 21-9. From the start, it was apparent that the Koreans would be a handful for the World No.4 Japanese. They kept a lead until the end of the opening game, after which Kim blew a couple of winning shots and the game swung Japan’s way. But Lee was unflappable, and soon his high-quality play – in defence and the serve-return situations – started to wear down the Japanese. Calmly driving back whatever was thrown at him, and creating vacant spaces with the angles and variations of his return, Lee was masterly, allowing Kim the openings he could fire his big smashes into. Kim, for his part, rushed a few shots, but overall the Koreans simply blew away the Japanese in the second and third games. Kamura crumbled under the sustained pressure of the Korean defence that barely did a thing wrong. His partner acknowledged he was still struggling to find his best form: “This is my first Korea Open in two years and at the beginning of the first game today I was really nervous and made a lot of mistakes. I was rushing things. Then I managed to settle down and play the rest of the match more comfortably. Lee and Kim take on another Japanese pair – Takuro Hoki and Yugo Kobayashi – in the quarter-finals. Zhao faces last year’s runner-up Jonatan Christie (Indonesia), who wasn’t troubled by Hong Kong’s Hu Yun (21-12 21-14). The other semi-final in the top half will see Korean qualifier Heo Kwang Hee – who held off senior compatriot Son Wan Ho 15-21 21-13 24-22 – against Indonesia’s Tommy Sugiarto. 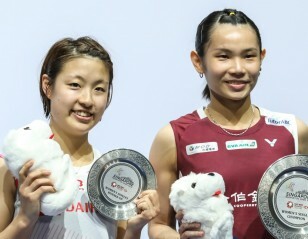 Women’s Singles top seed Akane Yamaguchi (Japan) avoided Axelsen’s fate as she stayed stubborn in the face of a difficult challenge from China’s Chen Xiaoxin to emerge triumphant, 24-26 21-19 21-17. Sixth seed Beiwen Zhang (USA) also had her back to the wall against another young Chinese, Cai Yanyan, who refused to buckle despite trailing in the second and third games. 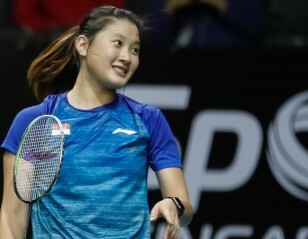 Zhang shook off her pursuer 15-21 22-20 23-21 and let out a long sigh of relief. 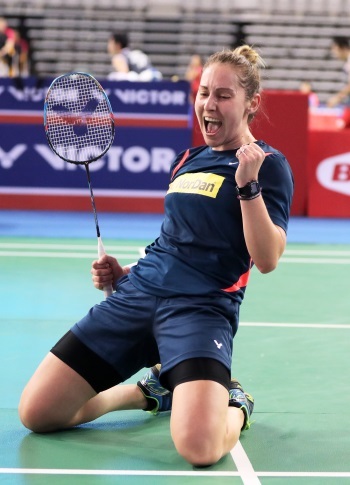 Zhang takes on Scotland’s Kirsty Gilmour, who beat Thailand’s Ratchanok Intanon for the first time in four matches, 21-18 21-17. “The hall came into play a bit, it’s a bit windy in there and that means it’s anyone’s game,” said Gilmour. “The person who can control it a tiny bit better will take it. I think the trick was not to think about it too much, just try to play as free as possible. “I’ve played Beiwen a few times, most recently the Indian League. It’s going to be interesting tomorrow, she’s very skilful. No match in this tournament can be easy. It’s when I start getting ahead of myself that’s bad news for me.